330 Commonwealth is located on the south side of Commonwealth, between Hereford and Massachusetts Avenue, with 328 Commonwealth to the east and 332 Commonwealth to the west. 330 Commonwealth was designed and built by O. H. Drisko & Son in 1888 on land owned by woolen manufacturer James S. Gill. He and his wife, Rachel M. (Wood) Gill, lived at the Hotel Kempton at 237 Berkeley and then at 374 Newbury. The house was built on the western half of a 49 foot 4 inch lot that James S. Gill purchased on February 23, 1886, from Miss Elizabeth F. Brigham. 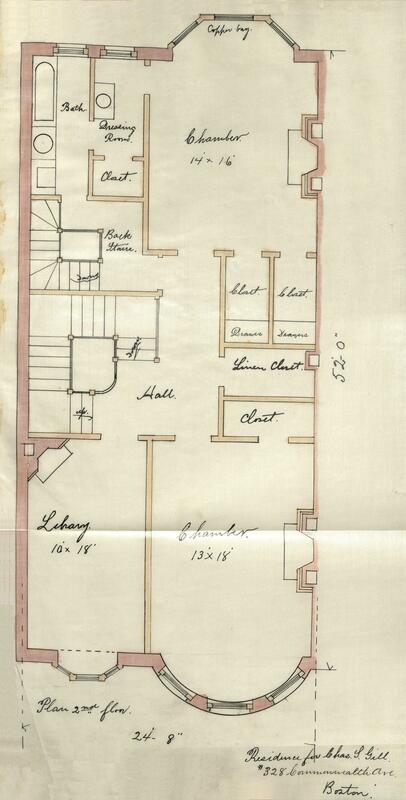 Charles S. Gill, presumably an incorrect reference to James S. Gill, is shown as the owner on the original building permit application, dated April 9, 1888, and on the final building inspection report, dated January 4, 1889. The lot purchased by James Gill from Elizabeth Bingham was part of a larger tract originally purchased from the Boston Water Power Company on December 16, 1870, by lumber dealer David Nelson Skillings of Winchester as trustee for a trust composed of himself, Lawrence Barnes of Burlington, Vermont, Charles Whitney of Lowell, and David Whitney, Jr., of Detroit. 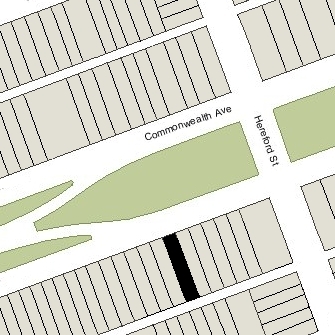 Click here for an index to the deeds for 330 Commonwealth, and click here for further information on the land on the south side of Commonwealth between Hereford and Massachusetts Avenue. The houses to the west of James Gill’s lot had already been built and were numbered 330-358 Commonwealth, and the houses to the east also had been built and were numbered 316-326 Commonwealth. The house built on the western half of James Gill’s lot was originally numbered 328 Commonwealth (which appears on the original permit application). After the house was completed, he sold the vacant lot to the east to Isaac P. T. Edmands, who built his home on it. That house was then numbered 328 Commonwealth and all of the houses west of it were re-numbered 330-360 Commonwealth. On September 27, 1888, 330 Commonwealth was purchased from James S. Gill by Mary A. (Watson) Ferguson, the wife of dry goods merchant Robert Ferguson. They previously had lived at 386 Marlborough. Robert Ferguson died in August of 1894. 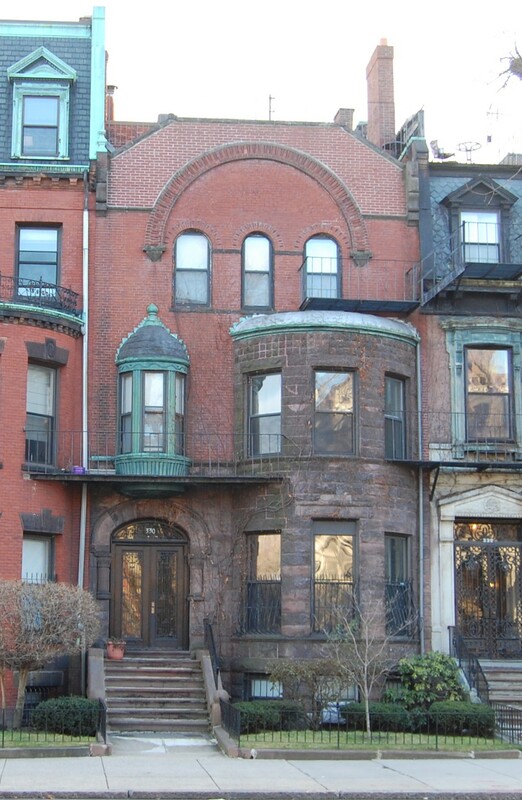 Mary Ferguson continued to live at 330 Commonwealth during the 1898-1899 winter season, but moved thereafter to The Buckminster at 645 Beacon (at the corner of Brookline Avenue). She continued to own 330 Commonwealth and lease it to others. 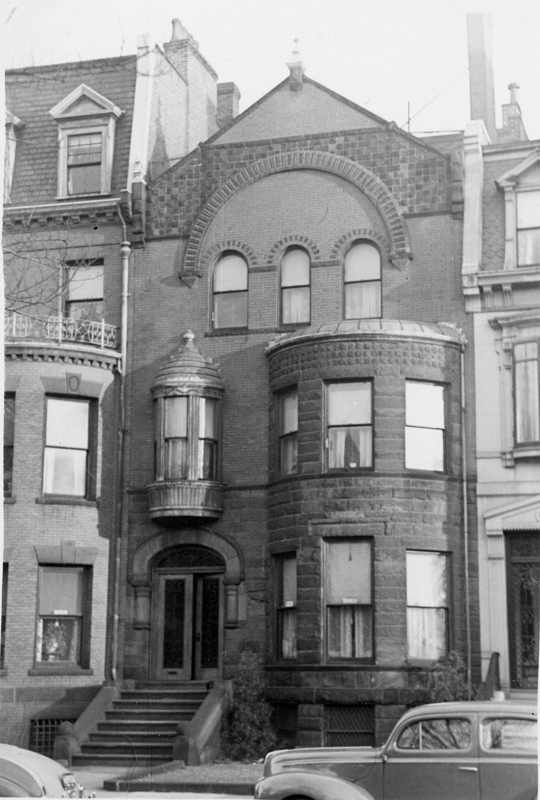 By the 1899-1900 winter season, 330 Commonwealth was the home of Homer Lane Bigelow and his wife, Mary Sanborn (Rice) Bigelow. He was a jeweler in his family’s firm, Bigelow, Kennard & Co. They previously had lived in Quincy. 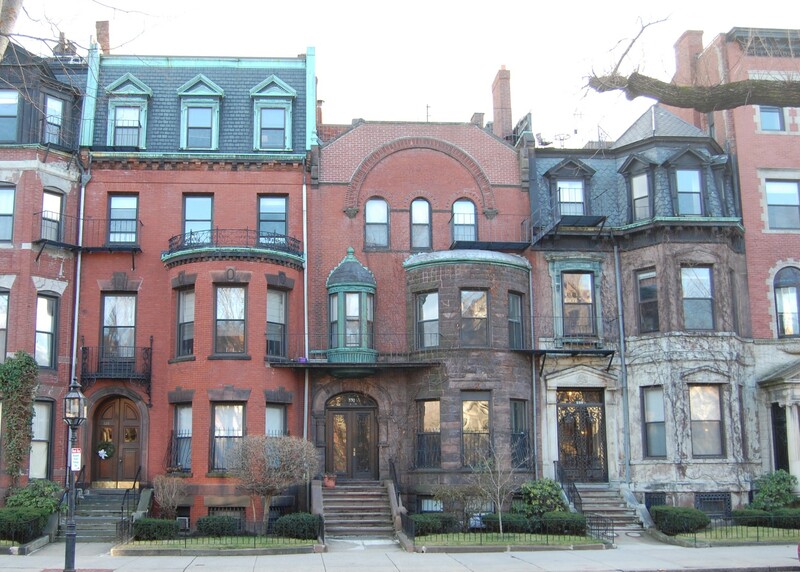 They continued to live at 330 Commonwealth during the 1902-1903 winter season, but moved thereafter to Chestnut Hill. During the 1903-1904 winter season, 330 Commonwealth was the home of attorney Daniel Caldwell Stanwood and his wife, Marion Douglas (Haynes) Stanwood. They had married in June of 1902 and then had lived at The Charlesgate at 535 Beacon. Marion Stanwood’s parents, Josiah Manchester Haynes and Sarah Elizabeth (Sturgis) Haynes, lived with them; their principal residence was in Augusta, Maine. The Haynes left for Europe in mid-1904 and the Stanwoods moved to 64 Commonwealth by 1905. On December 22, 1904, 330 Commonwealth was purchased from Mary Ferguson by Minna J. (Gaul) Stackpole, the wife of Frank N. Stackpole. They previously had lived at the Hotel Lenox at 61 Exeter. Frank Stackpole was a manufacturer of shoe blacking. Frank Stackpole died in March of 1926. Minna Stackpole lived elsewhere for several years. During the 1926-1927 winter season, 330 Commonwealth was the home of Lawrence Hungerford Hansel and his wife, Barbara (Barnes) Hansel. They previously had lived in Brookline. Living with them at 330 Commonwealth was Mabel Robbins (Farnum) Bowden, the widow of Herbert Lincoln Bowden, who had died in April of 1926. Prior to his death, they had lived in Marblehead. Herbert Bowden had been treasurer of The Felters Company, felt manufacturers; Lawrence Hansel was assistant treasurer of the same company. By the 1927-1928 season, the Hansels had moved to an apartment at 90 Commonwealth, and Mrs. Bowden had moved to the Ritz-Carlton Hotel. During the 1927-1928 and 1928-1929 winter season, 330 Commonwealth was the home of Lt. George R. Burgess and his wife, Anne Barbara (Sands) Burgess. They had married in October of 1926. He was a lieutenant in the Coast Artillery Corps. By mid-1929 the Burgesses had moved to 101 Chestnut and Minna Stackpole was living at 330 Commonwealth once again. She continued to live there until her death in May of 1940. On January 15, 1941, 330 Commonwealth was acquired from Minna Stackpole’s estate by Dr. Emil George Maloof, a physician, and on the same day it was acquired from him by Frances Ellen (born Frances Eleanor Lillian) (Gardner) Reith, the wife of Dr. Howard Cartnick Reith, a dentist. They lived in Winthrop. That same month, Frances Reith filed for (and subsequently received) permission to convert 330 Commonwealth from a single-family dwelling into a lodging house. On June 19, 1941, 330 Commonwealth was acquired from Frances Reith by her mother, Frances E. (Edmunds) Gardner, the widow of Alanson Dean Gardner. She lived in Winthrop with the Reiths and operated lodging houses at 232 Newton and 106 St. Botolph. By 1942, 330 Commonwealth was the home of Dr. John J. Fitzpatrick and his wife, Margaret (Matheson) Fitzpatrick. He was a dentist and may have maintained his offices there as well as operating a lodging house. They previously had lived at 22 Rexford. They continued to live at 330 Commonwealth until about 1949. Frances Gardner died in April of 1949. In June of 1949, Frances Reith, as executrix of her mother’s estate, filed filed for (and subsequently received) permission to convert the property from a lodging house into a lodging house and one apartment. On August 8, 1949, she transferred the property from her mother’s estate into her own name. It appears that Frances Reith lived part-time at 330 Commonwealth, running the lodging house herself. She and her husband continued to maintain their primary residence in Winthrop until the late 1950s, when they moved to 290 Beacon. On September 27, 1963, she transferred the property to the Reith Realty Corporation. On November 1, 1966, 330 Commonwealth was acquired from Reith Realty by Jack Aifer. He already owned 328 Commonwealth and 334 Commonwealth, and subsequently acquired 336 Commonwealth and 344 Commonwealth. On May 4, 1967, Robert White acquired 330 Commonwealth and Jack Aifer’s other four houses on the block. He already owned 324–326 Commonwealth and 348 Commonwealth. By December of 1978, he owned 322–324–326–328–330–332–334–336 Commonwealth, 344-346-348–350 Commonwealth, and 354–356–358–360 Commonwealth. In December of 1988, he applied for (and subsequently received) permission to convert 330 Commonwealth from a lodging house and one apartment into eight apartments. At the same time, he also applied for (and subsequently received) permission to combine it with 322-328 Commonwealth and 332-334 Commonwealth into one property with 63 apartments, to be known as 322-334 Commonwealth. 336 Commonwealth remained a separate property. 330 Commonwealth remained an apartment house in 2018.